Have questions? Send us a message below. Please remember to include the quantity, size (including thickness), and general usage of you cushions when inquiring about a quote. A comfort expert will use this information to recoomend an appropriote sewing style and fabric choice for your project. Please also let us know if you intend to purchase fabric from our selection, or provide your own for your project. Please remember to include the quantity, size (including thickness), and general usage of your custom foam when inquiring about a quote. A comfort expert will use this information to find the right foam solution your project. Please remember to provide the size and style of mattress you are looking for. 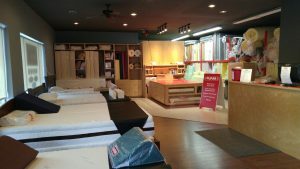 If you are unsure of your mattress options, you can find more information here: (link to mattresses) or a comfort expert will be happy to recommend a mattress for you. Our Courtenay Store is located New Island Highway, just off of Veterans Memorial Parkway – neighbors with Eldorado upholstery. Our Courtenay Store is our newest store! 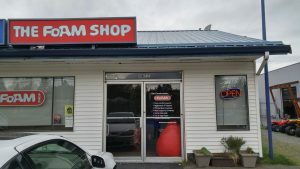 As par of our expansion on Vancouver Island, our The Foam Shop Courtenay proudly serves the surrounding communities with our custom cut comfort.